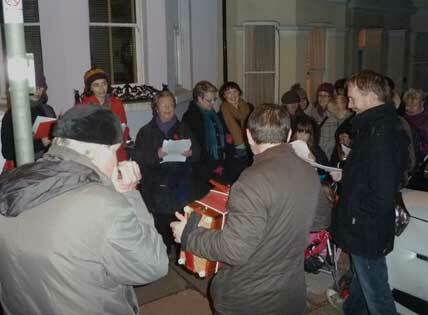 See Round Hill Community Noticeboard for report on this year's carol singing, which raised £160. Brighton Housing Trust First Base. Many thanks to those who donated and took part, to Andrew for the misic, to Sainsbury for mince pie and drink donations and also to Kate Rice for the above picture. This year, our neighbourhood raised a record-breaking £299.65 for MartletsCare (the branch of The Martlets charity providing quality home care in and around Brighton and Hove). participation by a sufficient number of singers to deliver reasonable renditions of twenty Christmas carols. I agree with observations that the singing was better than in previous years. It is fair to note that the absence of wind made it easier, this year, to be heard and to hear one another! the generosity of Round Hill residents who came to their doors. I have a hunch that several households were expecting us - a possible consequence of the growing membership of The Round Hill Community Noticeboard Facebook Group (now approaching 300 members). We have two physical noticeboards too in Ashdown Road and on the side wall of Red, White and Rosé in Princes Road - all adding up to improved publicity. We were helped, this year, by good fortune as well. Heavy rain can wipe away the event, as it did in December 2015. This December 2017, it rained on 13th and 15th, but not on 14th - the day of the carols. It was a crisp evening with good visability and not much wind. 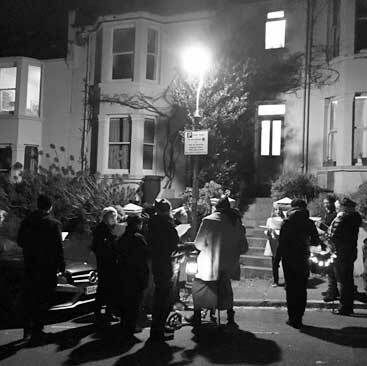 I was concerned at the 6pm start at the west end of Roundhill Crescent that we had a small number of singers to get the event started, but voices carried well in the still air (as we embarked on "The 12 Days of Christmas") and there was no need for worry. We took a slightly longer route, this year, to include D'Aubigny Road, which was omitted last year. However, the timings worked out very well and the procession reached the north end of Crescent Road (where it meets Princes Road) shortly after 7.30pm, keeping more or less to the 90 minutes we had estimated. This made it easy for Rob, Jacky and Jane to make sure that the mulled wine, hot mince pies and patio gathering space, were all prepared. Lewes Road Sainsbury again deserve our thanks for donating several bottles of mulled wine and packets of mince pies and other ingredients. Jane and I (Ted) really enjoyed hosting the finish of the event. The conviviality of the occasion has left us wanting to do it again, unless there is competition from other residents, in which case we would gladly step back and enjoy being hosted. We are aware that some Round Hill streets (e.g. 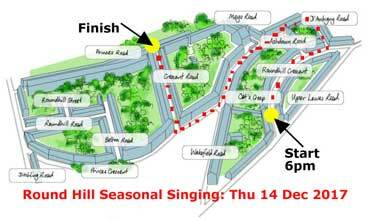 much of Roundhill Crescent, Princes Road, Mayo Road, Belton Road, Round Hill Road and Round Hill Street) have not been on the carol singing route for 3 or 4 years. 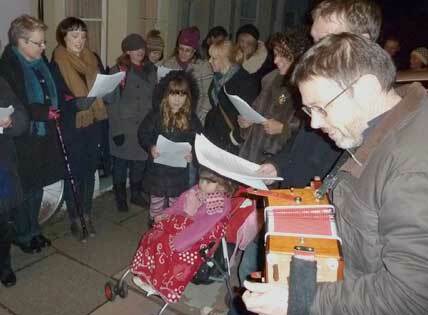 We were glad to see residents from some of those streets joining in with the singing. The event is built round (i) a starting place (ii) a finishing place and (iii) about 90 minutes in between which can be extended or shortened subject to the weather which singers and musicians are having to endure. The demography of Round Hill is changing. When I moved here 40 years ago, the weekly queue for old age pensions at the Post Office (now Red White and Rosé) was massive. Younger families now appear to be gaining better representation. Although work and children place restrictions on time, it is great to see residents of all age groups joining in community events. Our hope for increased younger representation on our Round Hill Society committee has been partially satisfied this last autumn. Thank you to all Round Hill residents who gave generously to The Round Hill Society's Seasonal Singing on 15th December 2016. You raised £181.40. 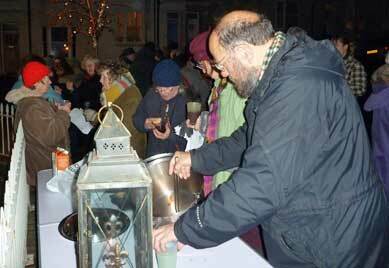 The money raised will very shortly be paid by The Round Hill Society to The Mayor's charities. The current Mayor of Brighton and Hove is Round Hill's ward Councillor Pete West. See The Mayor's Facebook Page for details of his fundraising actvities. Also to be thanked for raising this total are the people who turned out to sing, play instruments, and to knock on doors with buckets to invite donations. Last time, we ran this event (the year before last) we were short of volunteers to door knock. This year, more people came forward to collect, though we could do in the future with even more collectors to release those who would like to do a stint of singing. 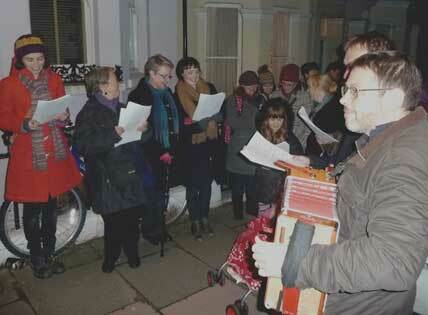 As it was, the singing was clearly audible and we got to sing every one of the twenty carols on our songsheets. Also, we had the benefit this year (as most) of both melodeon player Andew Partington and harmonica player Derek Curry (Rusty). The event was well supported this year. The size of the party grew somewhat as the route unwound (the pied piper effect!) which is always nice to see. 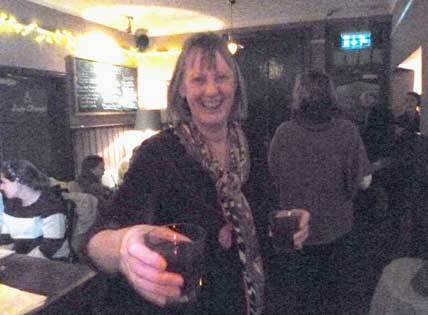 Among the party were some who had recently moved into Round Hill as well as long-standing residents. We also had participants from the neighbouring Triangle community. 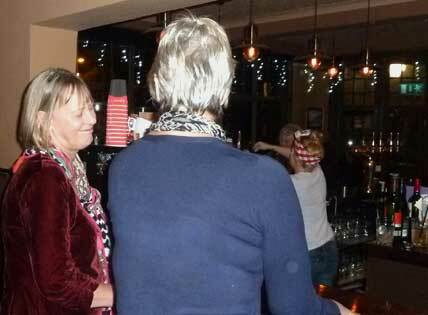 Saturday, 17th December 2016 07:30pm Brighton Pub Carols - Sir Charles Napier - 50 Southover Street BN2 9 Brighton. Please note: the above events are targeted mainly at people living near their venues or regular customers to the pubs. These are very popular events, but accommodation is limited. 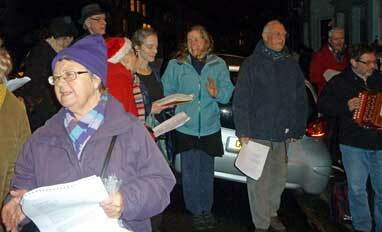 The Round Hill Society's Seasonal Singing was well supported on Thursday evening. 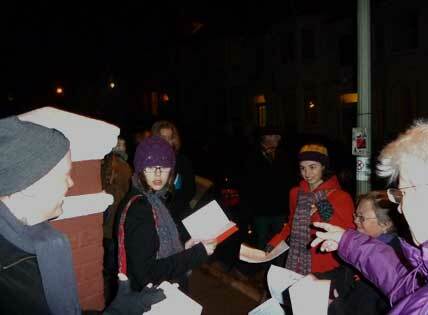 We assembled as usual in Round Hill Crescent at the bottom of the Cat Creep and kicked off with The Twelve Days of Christmas. 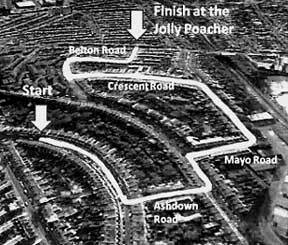 Deck the Halls, God Rest Ye Merry Gentlemen and Jingle Bells followed as we made our way round the crescent towards Ashdown Road. Our instrumentalists, Andrew and Bela, provided excellent support. 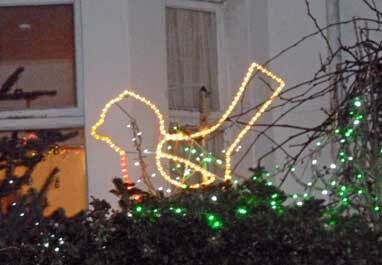 Christmas cheer was much in evidence as friends within the neighbourhood bumped into one another. We had more bucket collectors this year, including Bonnie - our community support officer from Sussex Police. We thank them all as well as all the residents who donated. 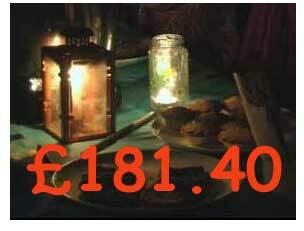 Donations this year came to £168.12 and will again go to Brighton Housing Trust to support the First Base Day Centre. Have a look at the recent article in The Argus about what this centre does. 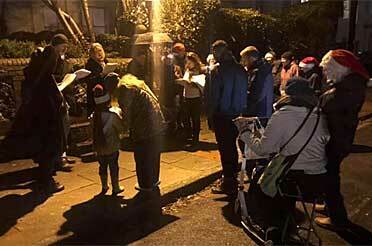 Our last carol in Round Hill Crescent was O Little Town of Bethlehem and residents in Ashdown Road were treated to Once in Royal David's City. 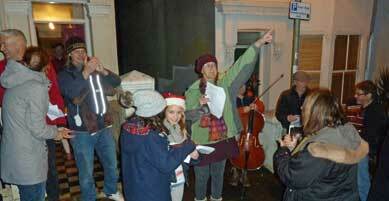 On arriving at the junction with Richmond Road, we sang Rudolph the Red Nosed Reindeer twice! 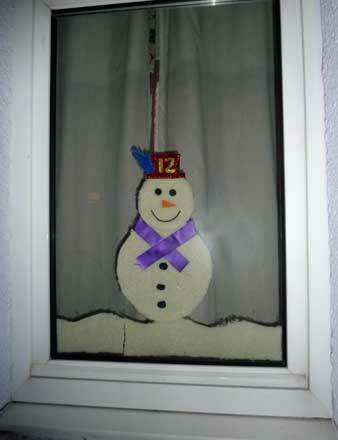 We were offered a different key for the second rendition, but did not take it, instead focusing on some of the lovely advent window displays which have appeared this year in this part of our neighbourhood. 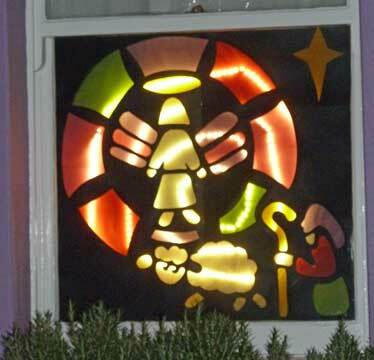 We witnessed some lovely advent window displays as we passed residents' homes. 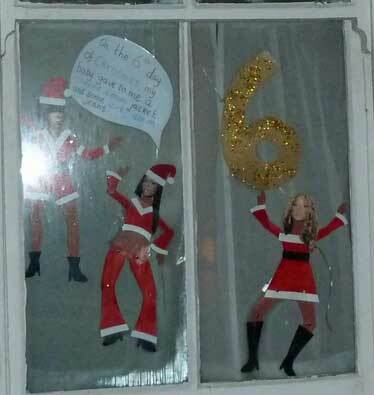 Houses in Richmond Road have made a special attempt this year to replicate some of the lovely advent window displays which have become part of the Belton Road scene in Round Hill over the last five years. 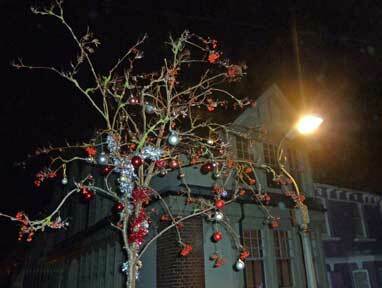 Reaching the junction of Richmond Road and Mayo Road by the former Victoria Pub, we sang In The Bleak Mid Winter by the lamp post and a tree which had been decorated for the occasion. 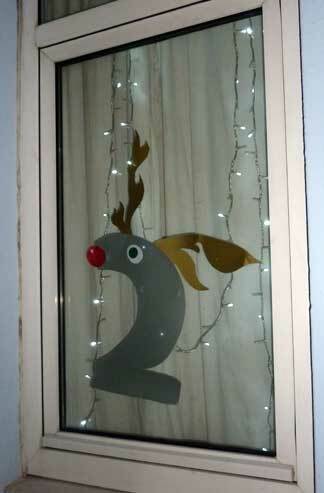 Further up Richmond Road, there were further advent window displays with an animal theme. We sang White Christmas twice followed by While Shepherds Watched. 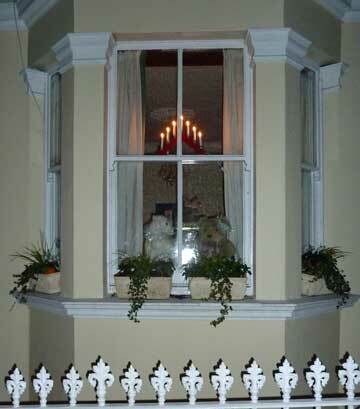 True to the 'animal theme', we soon arrived at the top of the Cat Creep where we sang We Wish You A Merry Christmas. 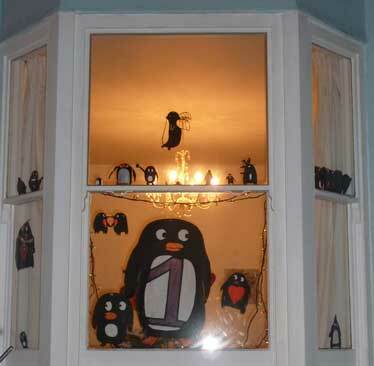 Then the chair of our residents' association pointed the way along Princes Crescent towards Belton Road, the local inspiration for all these displays. In Princes Crescent we sang Here We Come A-Wassailing, and we then announced our presence in Belton Road with O Come, all ye fathful. 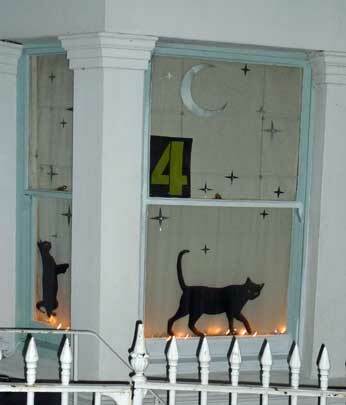 We were given a very friendly reception from the residents who came to their doors in Belton Road and the window displays lived up to local expectations. By the time we got to the north end of Belton Road where Tower Windmill had once stood, we'd also managed Ding Dong Merrily On High and Hark the Herald Angels Sing. 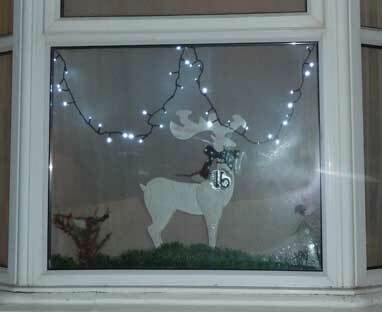 We then doubled back to our finishing place at the junction of Mayo Road and Richmond Road, singing Good King Wenceslas and Away in a Manger en route. 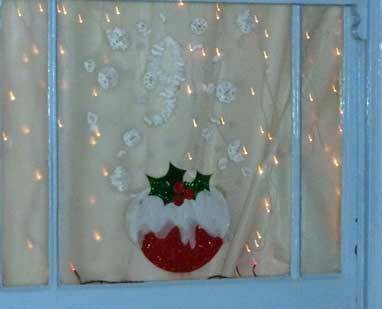 We added I Saw Three Ships Come Sailing In and The Holly and The Ivy on our arrival. We managed to get through all 20 carols! 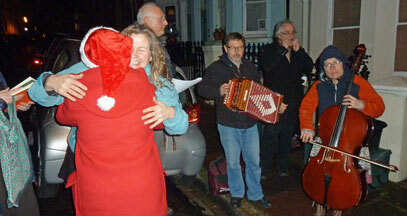 Having sung them all, our reward was hot punch and mince pies served by Rob and Jacky. 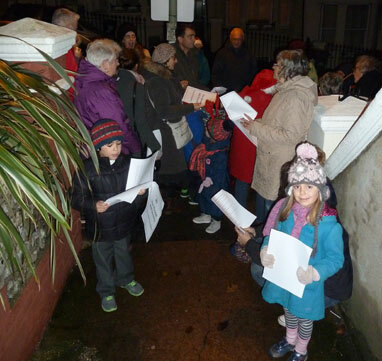 2013 Round Hill Seasonal Singing Round Hill residents raise £153.86 for First Base Day Centre Between 6pm and 7.30pm on Thursday 19th December, residents of all ages, including children with lanterns / bells / luminous bracelets, and musicians (melodion, cello, harmonica & fiddle players) treated other residents to some well loved Christmas carols. Several of these were led by a chorister with a beautiful voice who was visiting Sandy and Henry in Round Hill Crescent. Song-sheets were provided and the route took us from Round Hill Crescent, through to Ashdown Road, part of Richmond Road and the end part of Princes Crescent. This gave time for at least three repetitions of Rudolph The Red-nosed Reindeer and our younger singers pleased by inserting amusing add-ons between the lines. Those who came to their doors (stayed there for a while!) and heard these renditions were appreciative. A big welcome to the residents who have just moved into Round Hill Crescent who were delighted to witness the presence of community. We hope your family will join us when we repeat the event next year. Apologies to residents who were expecting us to loop around in Crescent Road, before we claimed our hot mince pie and hot drink - mulled wine for those permitted the alcoholic option. The rain came tipping down just after we got to the end of Princes Crescent and the driving wind which joined this downpour reminded us of the worst weather conditions which those without homes sometimes encounter. The event ended somewhat promptly, but full marks to Rob and Marian for having the refreshments ready before there was no option for residents other than a quick retreat to cosy living rooms. This year's collection, kindly donated by residents whose homes we passed, came to £153.86, which will be used by Brighton Housing Trust to support the First Base Day Centre. First Base offers a range of services to support people who are sleeping rough or insecurely housed in the city, to get off the streets, start realising their aspirations through work, learning and leisure and find a place they can call home. 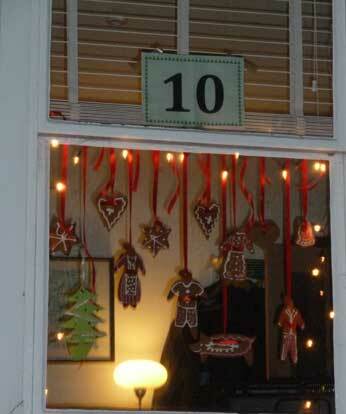 By 6.30pm on Thursday 20th December (our seasonal carol day), the weather had turned dryer and milder. The turn-out of singers included all age-groups and grew larger as the event progressed. 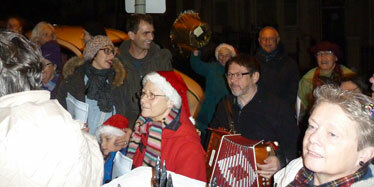 The Jolly Poacher were very welcoming and treated a healthy number of us to the traditional mulled wine and mince pies. Donations were especially generous this year. 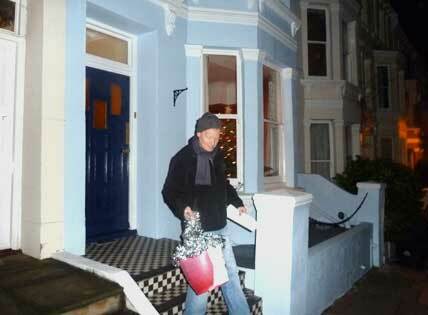 It was pleasing that so many residents stepped out of their front doors to exchange Christmas greetings. Their offerings raised £200.28 for Martlets Hospice. Thanks to all who participated, our bucket collectors, and especially to Rusty who provided harmonica accompaniment to all but one of the carols, but sang the words to White Christmas with us instead! 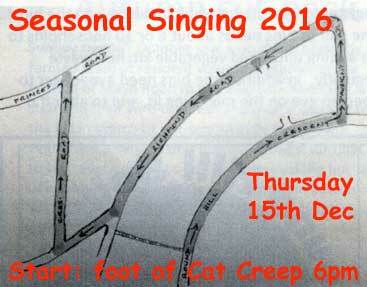 Last year's seasonal singing raised £170. Thanks were due both to those who took part in the event (including musicians / singers / caterers / organisers) as well as to residents who made generous donations collected by Annie and Dave. 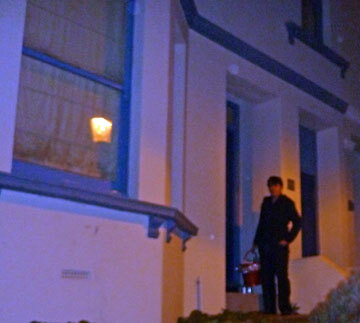 We started out from the foot of The Cat's Creep in Roundhill Crescent. 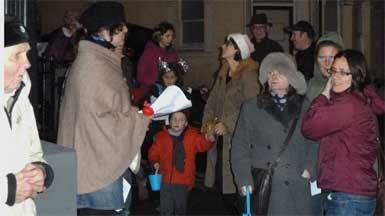 In 2010 we had to cancel the street singing event because the weather was so bad. December 2011 was kinder, though singers and musicians had to brave the wind and the rain towards the end of the event. Crescent Road and Princes Crescent had to be omitted once the rain had destroyed our paper song-sheets and made life difficult for our regular musicians. while Andrew, who had to stop himself from playing the Yorkshire version of The Holly and The Ivy added both melody and some interesting effects on the accordian (or was it a melodeon?). It was gratifying once again to see participation from all age groups; The Roundhill Tavern was very accommodating in this regard, providing reserved tables as a family seating area. Jane (left) and Carol (right) volunteered to help with the catering. 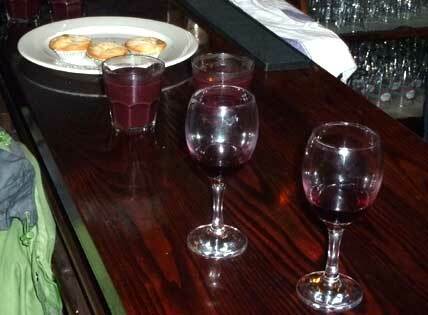 Nevertheless, there was still need to distribute the pies and mulled wine to a procession of people who came in from the wet and the cold in two large groups, one (including small children) making a faster dash to the pub than the other, which decided to give the residents at the west end of Princes Road an unscheduled carol. 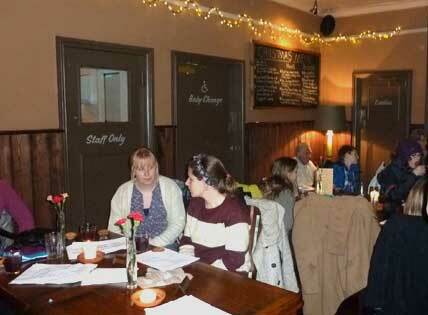 The Committee should like to thank all who supported the event. This year, our appreciation is extended too to Sean (the landlord) and the staff of The Roundhill Tavern for their much needed hospitality on a wet windy night.